Both on supply and demand side prospects for the NGLs market look bright. In particular, U.S. production is expected to grow by 15% in 2019. Most of the scheduled capacity will be paired with derivative units so spot prices will not be heavily affected. Behind the expected output increase stand several key facilities, most of them to be completed in Louisiana. The Number One hub for these projects is the Lake Charles area. Indorama Ventures is about to complete its long-awaited 420,000 tonnes/year cracker unit. It will process ethane and propane feedstocks to produce 370,000 tonnes/year of ethylene and 30,000 tonnes/year of propylene. The facility, idled back in in 2001, was acquired in late 2015 from Occidental Chemical (OxyChem). It is currently in commissioning and should go operational early in 2019. Sasol’s Lake Charles Chemical Complex consisting of seven manufacturing units situated on approximately 400 acres will have tripled the company's chemical production capacity once an ethane cracker with annual capacity of 1.5 million tonnes/year of ethylene will be put to service. Approximately 90 percent of the cracker's ethylene output will be converted into a diverse commodity and high-margin specialty chemicals. The cracker is reaching mechanical completion in December 2018. 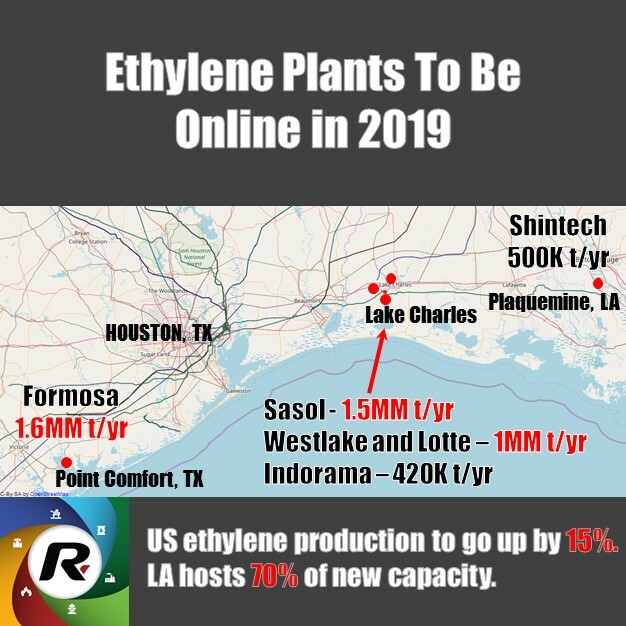 Finally, Lake Charles petrochemical project, a JV by Westlake Chemical Corp. and Lotte Chemical USA Corp. (South Korea), will put in service an ethane cracker to produce more than 1 million-tonne/year of ethylene. The Lake Charles ethylene plant is scheduled for startup during first-quarter 2019. Formosa Plastics Corp. USA. is currently building a 1.6 million tonnes/year plant here. It is to begin operation in 2019. Shintech Inc., the U.S. subsidiary of Shin-Etsu Chemical Co. Ltd., Tokyo, is building a 500,000 tonnes/year ethylene plant here. The company had planned to reach mechanical completion by the end of 2018 and to begin start-up during the first quarter. The ethane cracker is part of an expansion planned to support feedstock for the company’s ethylene vinyl chloride (VCM) and polyvinyl chloride (PVC) production. Information about other U.S. petrochemical facilities including NGL/LPG/HV pipelines can be discovered on Rextag’s U.S. Natural Gas Liquids Infrastructure maps.